At the end of every year, I like to do a retrospective of the previous year’s events. It reminds me to always be thankful for the ups in life and to remind me how lucky I am to have such wonderful friends and family. 2012, as you know, was a biggie for us. Our little family got an inc1 in the form of a gorgeous little Blueberry. January brought my long lost friend Cam back into the fold, we moved from bunnies to dragons and from Gaggia to Nespresso and haven’t look back since. My mom came to stay and wait for the baby to pop out, and I seriously could not wait to finally have baby out of me (the itching was driving me nuts). February was a waiting game filled with all manner of lotions and potions for the itching. My mom and Meimei totally bonded, and I was GINORMOUS. Baby was 10 days late when I finally was induced and watched Bones while waiting to dilate enough for baby to come out. Which never happened as I ended up having an emergency c-section. No matter, baby came out nice and healthy! Both my mom and dad were there for the birth, and when they left I have to admit I felt really really wobbly. Despite being a pretty independent person (I left home at 18 and travelled all over, with nary a whisper of homesickness), when my mom left I felt suddenly incredibly and overwhelmingly anxious. Thankfully hubby took an extra week off and it made all the difference. In March hubby and I finally announced baby’s official name. We started to find our rhythm with the three little monkeys, helped enormously by our littlest monkey’s penchant for sleeping like a snug little bug in a rug. I took baby for a walk up the Peak. She slept in her little moby wrap pretty much the whole way up. In April hubby’s folks came to visit, and baby had her very first Easter and saw her very first pandas. 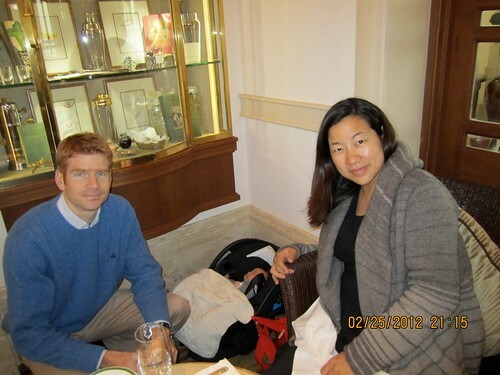 We celebrated with brunch at the historic Verandah restaurant in Repulse Bay. I even had some champagne! Amandine slept in a corner pretty much the entire time. Our helper Daisy joined our household and has enriched our lives. May brought my dear friend Alice over to Hong Kong, where we drove around mostly to IFC, a mall with AC. It was HOT. But Alice was on her way to Thailand where it was to get even hotter! She and Cam came back to HK where they picked me up for my first ‘solo’ trip with baby. Amandine and I hoofed it to Taipei for a few days to hang out with Cam & Kevin, and see the sights with Alice. We went to the National Palace Museum, Taipei 101, ate lots of Taiwanese beef noodle soup (my absolute favourite noodle soup), and enjoyed the Taipei weather – a gloriously pleasant and sunny spring. In June my little one started to swim which was the cutest thing ever. Amandine started her first round the world trip, first stop Calgary, Banff & Lake Louise. My dear friend Carole came to see us and my mom (the star that she is) drove us all over. I think secretly she was also afraid I had forgotten how to drive! lol. I got to see and spend time with my friends Alice, Thea and even a short visit with Alicja! Oh man, I really miss those huge prairie skies. August was another round of flights – hubby had a last minute kind of surprise sabbatical (at least 3 years overdue!) so we headed back to Canada to enjoy the summer. First we hit Vancouver, where we saw killer whales, otters, bald eagles, seals, and lots of gorgeous pacific northwest scenery, as well as my cousins Betty & Frank. We cycled round Stanley Park and wandered around Granville Island fantasising about living in that idyllic place. More time in Cowtown enjoying those blue blue skies, followed by a trip to Tronno to see Melissa and Luke and their bump and the lovely Cookie A (we tried to see Laura Chau but just missed her by a few hours! I bought yarn at Lettuce Knits as consolation). Toronto surprised me by how fun and cute it and neighbourly it was – inner city but Canadian style – that is, clean, well tended and friendly. Oh and the food was amazing too. We rounded off the month off with a short visit to Tokyo where we sweated (for it was HOT HOT HOT there) at the Imperial Palace gardens, ate sushi at 6 in the morning at the famous Tsukiji fish market and channelled Lost in Translation by staying at the Park Hyatt in Tokyo. What an absolutely gorgeous hotel. Sigh. September Amandine started swimming lessons and I began to get a little more plugged into HK life, joining a FB group for moms in my area. Amandine also began going to playgroups, including one called PEKIP which is basically a naked baby playgroup. Thankfully they get to wear diapers in HK, though the purist classes back in Germany keep it naked. I’m glad they are a little more practical here, as chasing a weeing or pooping baby trying to clean up after them doesn’t sound like much fun to me! Our furry middle child Meimei turned 1 – and has grown into an absolutely gorgeous dog. She loves to torment Deuce, normally ‘tickling’ Deuce by nipping his legs as he tries to kick her off while making funny little squeaking sounds. Crazy kids. In October my little man turned 6. My third child, the furless monkey, sprouted her first teeth. I bought a sewing machine – because I decided I wanted to make Amandine a Hallowe’en costume – a little Princess Leia. Found a Singer store and lugged home a machine which thankfully is made for dummies. Perfect for me! Completely automated everything. I only need to aim the fabric and step on the pedal. Bliss. November saw us flying off again for a wedding and family reunion. Amandine and I went to Calgary first where baby saw her first snowfall, then to Merida in Mexico for Romain and Marie’s fairytale nuptials. We went back to Calgary to rendez vous with my parents and uncle and aunt then flew to Miami Maui for a family reunion. Miami Maui was absolute heaven. Loved the coffee, the food, the vibe and the beauty of the place. I so want to go back. Seeing all my cousins and their kids (many for the first time) was just incredible. Spending time with them hanging out: priceless. Back in HK for December, a short trip to Phuket so hubby could get some sun (he had to miss Miami Maui due to work). Baby met and pet her first elephant in Phuket. I think we all fell in love with Lucky the elephant while there. Then we flew out again to Ctown to spend Christmas. 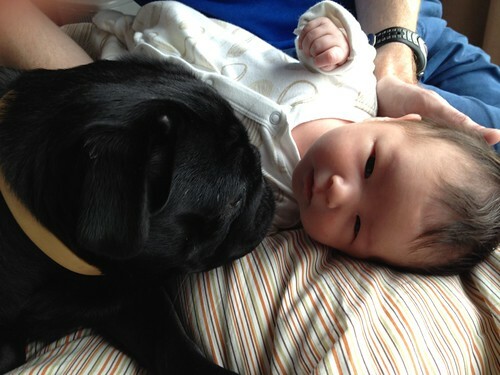 We rang in the new year with Melissa, Luke and their new little one Henry. A perfect end to an incredible year. We started with old friends, and ended with old friends, and in between made alot of new ones. This year’s amazing revelation: Pregnancy brain is real. My brain is like molasses and I often forget what I’m.. wait, what? Most favourite part of the year: Summer in Calgary. Hot, but dry with blue blue skies. Hottest vacation: Haha I live in Hong Kong where it is hot hot hot hotter hotter hot for the best part of the year, though I did feel August in Tokyo was almost unbearable. Best restaurant this year: Hmm, my most memorable meals this year aren’t quite in restaurants. My friend Romain’s brunch after his wedding had freshly made tortillas for tacos. These tortillas were made by a group of women sitting by the kitchen working away around a little table, with a small grill over a small fire to toast the tortillas. They shaped them entirely by hand. The piping hot tortillas were brought to the kitchen where the cooks would serve them up with various fillings – seafood, salsa, potatoes, I don’t even remember what the fillings were but they were completely and utterly delicious. I also loved this little hole in the wall place in Taipei where we had bowls of beef noodles in a gorgeous savoury rich and moreish beef broth. Yum! 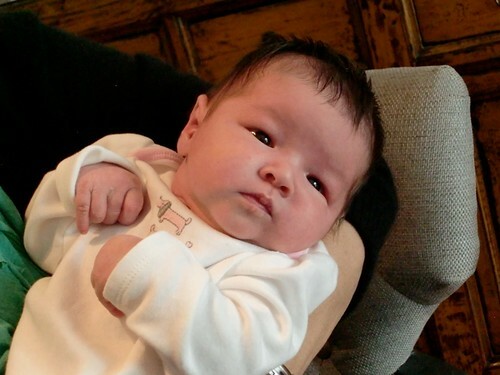 My best week this year: Let’s say best day – 18 Feb 2012 when little Amandine came into the world. Most exciting game this year: London Summer Olympics. What an incredible show. Longest walk this year: Probably my hike up the Peak post baby. Best events of the year: Miami Maui reunion, Merida nuptials, and eating sushi at the crack of dawn. Most amount of time spent on the water this year: Snorkeling trip to Molokini Crater in Maui. Most amount of time spent this year living without any females: None! 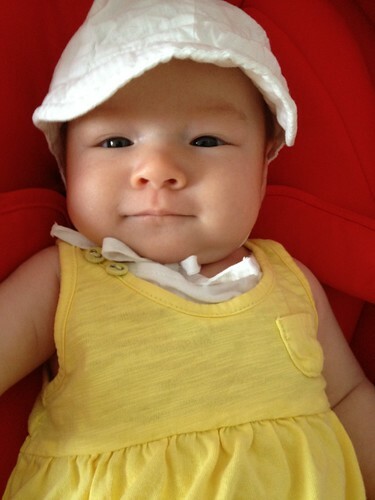 Meimei balanced the sexes in our household last October, and now with Amandine we ladies outnumber the guys by one! Cultural event of the year: Wow, this year has been pretty bereft of cultural (as in theatre, museums etc). Spent the day at the National Palace Museum in Taipei. That was pretty cool. I think the next closest thing is probably Les Miserables the movie! I don’t think seeing Cesar Milan in Calgary counts. This year’s most monotonous job: business accounts. ergh. Saddest events this year: Being away from the pups since we travelled so much this year, and when my folks left the week after baby was born. Shock of the year: Not being afraid of my sewing machine. And actually sewing a costume that had all the holes and arms in the right places! Most hopeful action this year: pledging £4 in hope others will do the same to campaign to end the war on women and stop abusive violent men from being in charge of making laws that are meant to protect women. Most beautiful sight: Sorry to be a stereotype, but I think my little one is completely gorgeous. My heart melts every time I look at her. Biggest surprise of this year: My birthday gift – a beautiful watch from hubby. Engraved with my name. Greatest technological improvement: Haha hubby finally got an ipad and ipod touch. So he is no longer an apple ignoramus (thank the Lord). People always say “they grow up so fast”. Time seems to expand and rush by at the same time when you can literally see your baby growing right before your very eyes. I can’t quite believe it was only 9 weeks ago that little Amandine took her first breath, and yet it feels like a lifetime ago! to a funny little thing who coos and laughs with us. She weighed in at 5.9 kg at her doctor’s appointment yesterday. She’s growing well and was very brave when she had her two vaccination shots. Poor lamb cried but give the gal a diaper change and all was right with the world again. Enough to even coo and smile at the doctor! This past week she’s also dropped her night feedings altogether (woohoooo!) – moving from a 4am wake up call last week to wakings around 730/8 am where she talks to herself or looks at the stuff around her crib for a little bit. Hubby was away on business for half the week – I think the little Almond knew her papa was away and so gave her mama a break and slept in to almost 9am on Wed Thur and Fri! I’m going to have to remember how grateful I am and give her a little slack when she’s 15 and pitching a teen fit. -discovering that Amandine’s circadian rhythm dictates a 10pm bedtime. She’d been regularly falling asleep and staying asleep around 10pm for a couple weeks, but it took us a few beats to realise this was her bedtime. We put her in her crib, she watches her lamaze black and white crib hanging and zones out. Asleep within 15 minutes. -establishing an evening ritual – bath time, feed, then good nights from her cow, and Mr. Bear, Raccoon, and Birdie from the crib hanging, and then Deucie, Meimei, Papa and me. -morning rituals – opening the curtains so she can look at her cow, bear, racoon and bird. Then good mornings from the whole crew again. She gives me a big grin when we do this. So sweet! 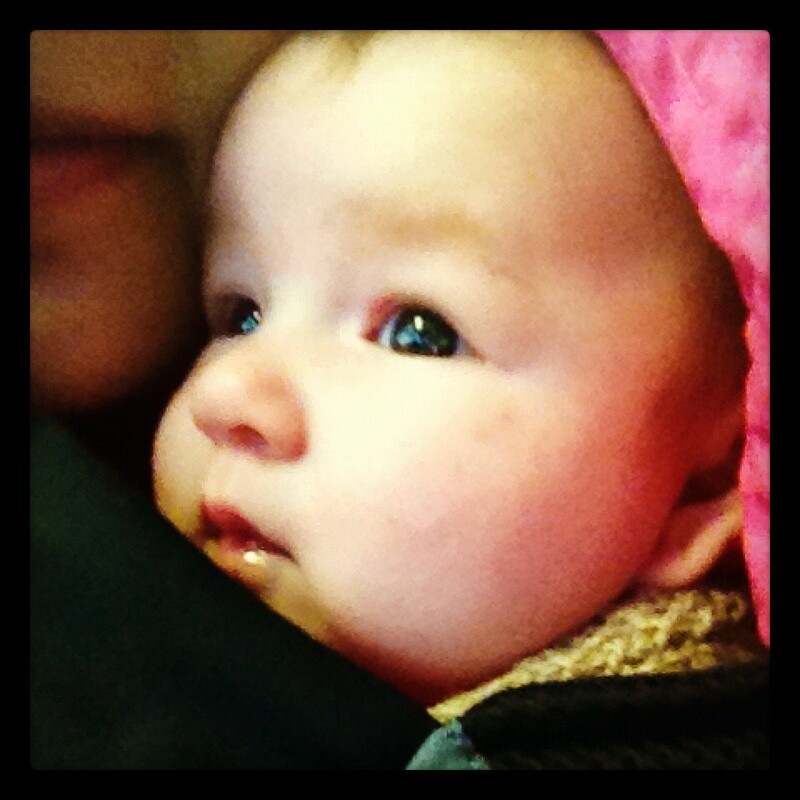 -going out and about in her ergobaby performance carrier. Love this thing. So much less hassle than the wraps – and with coolmax and breathable mesh hopefully much cooler in the heat too. -trying to convince her that papa loves her poopy diapers and that she should always save her poops for when he does the nappy change. Not sure how well this is working, though telling her how much papa loves poopy nappies always gets a smile from her. Auntie Carole sent a gorgeous knitted top, a tea set and the cutest monkey sleepers (so cute!). Auntie Tricia sent a knitted jacket which is perfect for the current weather (esp the hood when it starts to spit), and owl pjs. Amandine also received a knitted blanket from Auntie Anne which is totally gorgeous. She is such a lucky girl. I’m pretty darn lucky too – there was chocolate for me from Tricia (which was all gobbled up!) and yarn from Carole, neither of which I intend to share with anyone. 😉 And a gorgeous Les Abeilles shawlette from Anne & Cookie in Anne Hanson’s new Bare Naked Alpaca & Merino yarn from the march offering of her Bare Naked Club. Anne’s Fall in Full Colour club is opening again for sign ups soon. I was a member of the 2011 club and totally loved it. Our little one is now a whole month old. The days run into each other, from one feeding and nappy change to another it’s hard to distinguish between them. But what we do mark are her little changes – from smiling in her sleep to laughing in her sleep. She’s started to smile when we talk to her, and we’re looking forward to when she’ll be laughing when she’s awake too. Amandine & I went for a walk up to the Peak on Thursday with our neighbour M – it took us an hour to walk up but less than 30 minutes to walk down. My legs are stiff and I’m walking funny (waddling, like my pregnant days) but it was so worth it. A misty morning, perfect for a stroll through Pokfulam Park breathing in the green of the trees (incense trees and hawthorn) with a Starbucks at the top for a little rest and a drink. It’s a great route to do with the dogs so DH and I are going to give it a go before the snakes come out of hibernation. My days are now split into little bites of 3 hours. It’s an adjustment but little Amandine so far is playing nice. She’s sleeping through the nights now which is awesome and we’re enjoying it for however long it may last. She’s awake a little more – and sharing her toys already with the furry monkeys. Both Deuce and Meimei love her jungle gym. Meimei likes to lie on it and play with the dangling animals, and Deuce likes to chew on the leaves on the mat which make crinkly noises. What’s in a name? A helluva lot of negotiation! It took DH and me a rather long time to settle on a name we both liked. Much discussion and negotiation was called for, as we were pretty much on opposite ends of the naming spectrum, DH leaning towards turn of the century English names (very Downton Abbey) while my tastes run a little more exotic. I loved the name Ziva, but once Blueberry was born, my forerunner names just didn’t seem to suit her. David’s choices didn’t suit either (he really really liked Caroline, but I just couldn’t imagine my daughter as a Caroline). So we spent a few intense days trying to agree a name. Funnily enough, we both spent 5 minutes really liking Dakota (which is totally out to left field in DH’s choices), but ultimately opted against it, as I’m not a fan of naming a kid after actors and the English meaning of the native word is weird (it’s a plural). Mireille and Avenie were favourites but apparently Mireille is a bit of a grandma name in France (our friend R said that whenever he introduced his friend Mireille, people always asked her what did she do to upset her parents at her birth for them to give her that name), and we couldn’t agree how to pronounce Avenie. Well, we finally settled on a name, but wanted to test it for a week before making it official, just in case we changed our minds. 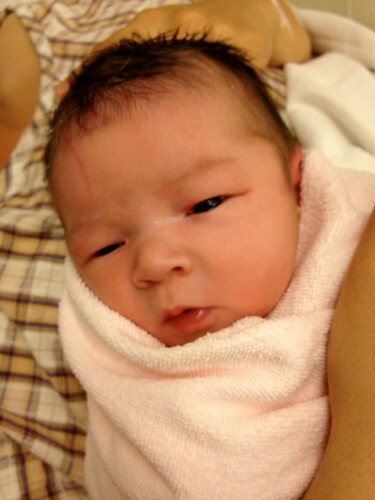 Test period is up, so let me introduce you to our daughter Amandine Isobelle Cotton-Yu. Amandine is pronounced long a as in ahhh, mun, long e as in deen, with the accent on the deen. The past week and a half out of the hospital has been a blur – my parents left on Wednesday and DH and I have been learning the rhythms of our new household and working out how to manage our appointments with Amandine. The first one was yesterday when I had to go back to the hospital to get my c-section bandage taken off. DH stayed at home with the wee ones. I was amazed that 1) there were no stitches at all (I still don’t know if they dissolved or I never had any to begin with – I certainly didn’t see any when I was discharged from the hospital) and 2) the scar is really faint already. Amandine has been an angel – she sleeps solidly after a feed, and doesn’t fuss much – which does make it alot easier for us to run errands. The pups love her – well, Meimei loves her and always comes to say hello and give her a little sniff and a kiss when I’m feeding Amandine, while Deuce just tries to squoosh up next to Amandine whenever he can. We take Amandine out most days, for a walk down to Cyberport (where I get a bubble tea). Next Monday we’ll probably head into town as DH has to do a medical for insurance and we need to pick up a baby gate and some bottles for Amandine so DH can feed her too. I was really sad to see my folks go – my mom was a huge help during my last uncomfortable weeks pregnant and once Amandine was born, and of course, they were great company. It feels quite empty in the flat without them, and I know Meimei is also missing my mom as she’s a little quieter than normal (she’s currently lounging on the sofa next to DH). DH though has the next week off which will be great as I was really dreading having to work out how to manage Amandine’s schedule, myself, and the two pups on my own. Before my folks left we all went for a heavenly brunch at the Verandah in Repulse Bay – I had lots of runny cheese and foie gras. Yumm! Amandine did what she does best at the moment – she slept the whole time in the corner (her car seat folds down flat so she can sleep). Good girl knew to let her mama pig out undisturbed!